This is a list of glitches found in the game Super Mario Bros. 2. For glitches found exclusively in the remake, Super Mario Advance, see List of Super Mario Advance glitches. NOTE: All names are conjectural unless otherwise specified. In World 1-1 or 2-1, if the player defeats Birdo, they must go to the Mask Gate and come back to where Birdo was fought. She comes back when the player returns, and the crystal ball that Birdo dropped will still be there along with her. When she is defeated, she doesn't drop another crystal ball. She cannot be fought again. This glitch has been known to work in NES and in Super Mario All-Stars. If the player throws a POW and then immediately picks a patch of grass where a Bob-Omb is hiding, the Bob-Omb appears to die and fall off the screen. However, the next time the player enters a new area, such as going through a door, climbing a vine, or dying and restarting the level, the Bob-Omb will reappear and explode, sometimes causing damage to the player. A Bob-Omb coming out of the Mushroom Block. This glitch will work on any version of the game. The player must go to World 5-3 and go to the jar spawning Bob-Ombs. The character he or she is playing as must throw a Mushroom Block so that it is two blocks left from the jar. Next, the player must wait for the jar to blow up. The character must go throw the Mushroom Block where the jar was, then go left to scroll the block off screen. When the player goes back to it, the Mushroom Block will be spawning Bob-Ombs. This glitch can happen in World 1-3. First, the player must enter the last door in the stage. Then, the player need to enter the door that has the Key with a couple of Phantos, pick up the key, and exit the door. The player needs to fall down to the space where there are Mushroom Blocks. When in the middle of passing by the Chains, the player must throw the key onto a wall, and it will look like that it is going to land on the player. If its done correctly, the key will bounce on the head of the player. If the player defeats a Spark with the bouncing key, there is an 85% chance of getting a heart. This glitch can also happen in the Game Boy Advance version and the All-Stars version. When climbing upwards very fast (with the fast climb glitch) at an area change point, the player can get above the screen without going to the new area. This allows fast access to other areas in some levels, such as World 7-2, where the player cannot get above the screen via other methods (due to lack of openings). The glitch happening in the Super Mario All-Stars version of the game. In any level with a Hoopster, the player can climb to the top of a vine and continue to hold up. If a Hoopster happens to come up to the top of the vine and push the character up while the player is still holding up on the controller, the character will be in the climbing animation a few feet above the vine. The character will fall as soon as the player lets go of the up control. This also works in the Super Mario All-Stars and Super Mario Advance versions. The player can climb climbable objects very fast by simultaneously holding both up and down. This usually isn't possible in a standard controller, but easy to do with a modified controller. It can also be done via Virtual Console, as the Wii Classic Controller and GameCube controller have both a Control Stick and D-Pad, which both serve the same function in NES and SNES Virtual Console games. Occasionally in World 4-1 on the NES version, when the player grabs the Crystal at the end of the level, the Mask Gate disappears and the players fall to their doom through the floor. The glitch on World 5-1. If the player throws a Magical Potion above the screen, and then goes through the door, they appear in Sub-space at the bottom of the screen and instantly die. Birdo being killed with a key. This can be done in level 1-2 of the game, as well as all of its remakes. After players get the key, they must then do a Super Jump off of a Ninji, and then they will find the door to the Birdo battle. Players can go into the door with the key, unlike Mushroom Blocks, enemies and vegetables. They can defeat Birdo with 3 hits with the key, although Phanto is still there to attack them. The player must have one heart left. He or she must pick up a vegetable and get touched by an enemy at the same time. If done, the vegetable will be thrown and the enemy will get hit by it. If the player throws a Mushroom Block offscreen and does not see it land, even to a place where it should safely land, it will disappear until the player leaves through a door and comes back. In an level containing a hill possible to reach the top, an enemy walking on it and vegetables (a good place is the area before the first Birdo battle) can be used to perform this glitch. With any character, the player must grab the vegetable and stand at the bottom of the enemy hill. Then, the player must jump to the enemy (while holding the vegetable), killing it. The dead enemy will fall to the character and touch him or her. If he or she is in small form, both will die. Mushroom Blocks inside various other scenery, in World 7-1. Mushroom Blocks can be dropped on top of certain interactive background elements. Usually these elements prevent the player from dropping a Mushroom Block, but if the player is near the edge of such elements and the normal background, sometimes it will become stuck in the element and temporarily adopt the palette. If the player leaves the area and come back (without going through a door) the palette will return to normal. If the player picks up the Mushroom Block, the element it was in front of is no longer there (chains, vines or ladders will no longer be climbable, and doors will become unusable if the player remove both the top and bottom elements). If an enemy (such as a Shyguy or a Ninji) is thrown while the character is either growing (from a heart) or shrinking (from an enemy), the thrown enemy will be trapped in the ground. When a Stopwatch is in action, enemies thrown will pass through the ground, like a vegetable. So, if the Stopwatch's effect ends while the enemy is in the ground, it will become trapped there. If the player throw an enemy (such as a Tweeter or Shyguy) at the top part of a hill sprite, the enemy will walk through the hill shivering. 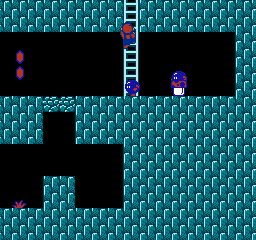 At a spot in the game where climbing down changes areas, the player can fall off the climbable object such as a ladder, vine, or chain, and fall offscreen and die, even though continuing in that direction should take them to another area. This only works in Super Mario All-Stars. If the player throws a Mushroom Block to a location it wasn't originally at, then goes through a jar and back out, there will be a Mushroom Block in both the original location and the one it was thrown to. This can be repeated many times; in fact, the character can be surrounded in Mushroom Blocks. If the player enters a door (or in case of last levels in worlds, a Mask Gate), pauses the game before the screen changes and enters (up) + + on the P2 controller before unpausing the game, the character will fall over the floor with each remaining life, leading to a Game Over. Upon receiving the Game Over, the glitch ends. This glitch does not work with doors leading to Sub-space. This glitch is only in the NES version. For this glitch to work, the player has to be Mario. On the last level, if Mario loses his power by an enemy as soon he enters the boss door to fight Wart, he will turn invisible. Animation of the first Magical Potion in World 1-1 dropped on top of the second Potion. Upon exiting Sub-space, the B button is pressed twice before the door disappears. If the player exits Sub-space above a patch of grass, and picks (and tosses) the grass fast enough, the item will be thrown, but still attached to the character's head. The item does not obstruct going through doors (similar to holding a key), nor does it interfere with climbing (unlike a key). The object becomes normal once the player goes to a new area (such as through a door, climbs offscreen, enters a jar, or goes to Sub-space), or dies. This allows items to be taken into areas they normally aren't found in. A Magical Potion taken into Sub-space will simply make another exit. Note that this is easiest to do with light objects such as small vegetables, or with Toad who can grab things faster. There must also be an unobstructed path to throw the object (not facing a wall, etc). In the overworld section of 3-2, it is possible to die while descending the ladder. This can be done by jumping in such a way that the player jumps into the very left edge of the ladder; pressing down will cause the player to die instead of descending the ladder. The maximum (displayed) life count in the NES version is 254. If the player earns more than 99 lives during gameplay, the tens digit of the life count gets replaced with a letter (100 = A0, 110 = B0, 120 = C0, etc. At the maximum life count, 254 = P4). If the player loses a life while the life counter shows A0, it goes to 99 and the glitch ends. In the NES version, if the player gets more than 10 coins in a stage (it may be hard to notice if exactly 10 coins are collected), in the Bonus Chance screen, the coin counter shows up as a letter (10 = A, 11 = B, 12 = C, etc.). Once that goes below 10, this glitch will end. Both of these glitches were fixed in the Super Mario All-Stars and Super Mario Advance versions, where the life counter maxed out at 99 and the coin counter is displayed correctly. The glitch in World 1-1. If the player throws a POW while standing on a log, the log falls upwards. Once it hits the top of the screen, the player will fall normally. This glitch remained in Super Mario All-Stars, but was fixed in Super Mario Advance. This only works on the Super Mario All-Stars + Super Mario World version of the game. To do this, the player must pick up a potion and throw it at the door. Then when the player goes through the door the same time the potion goes off, the game freezes, yet the music is still playing and the vegetables are still moving. The only way to end this glitch is to restart the system. The player must perform the Climb Very Fast glitch, and, while climbing, press or . The character jumps very high while crouched. While in Sub-space, the player must perform the Climb Very Fast glitch and still climbing when the time runs out. The character jumps jump very high when he or she is back to the main world. In Yume Kojo: Doki Doki Panic, many animated objects have two frames of animation. However, in Super Mario Bros. 2, this is increased to eight. However, due to a programming error, only seven of these show. Affected objects include Albatosses, POW Blocks, waterfalls, quicksand, grass, cherries, vines, conveyors, Spike Traps, and water. However, in some of these cases, the missing frame is identical to another frame, leaving them with two or four visible frames that appear to skip sometimes. This error is fixed in the enhanced ports. In the level 1-3, the player must take the first Magical Potion near the place where the second one is and drop it. Then, take the second Magical Potion and throw it near the first one. If the player enters one of the doors, the other door also opens, as if the player were entering it too. If the player pulls out a rocket, pauses the game before the screen changes and enters (up) + + on the P2 controller before unpausing the game, the player will not die and will be playing the remainder of the level with no health left. The miss music plays when doing this (although it may not be heard), and no music will play for the rest of the level. However, this also means that the player's character can take 1 hit before losing a life. No music will play until the player either changes rooms in which the music would change or loses a life. Sometimes, the player can throw certain collision objects (such as vegetables) offscreen. The player can quickly change areas such as going into a jar, and observe an enemy being defeated while making a "struck by object" sound effect, though no object sprite can be observed. A stuck spark on World 7-1. A Spark traveling along the floor or ceiling near Mushroom Blocks can be trapped in midair by grabbing the block at the right moment. 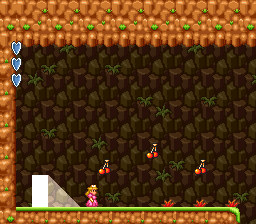 In certain areas, the player can throw a Mushroom Block onto the platform above the player without running or jumping. When timed correctly, the enemy will become trapped in the block. Anywhere there are enemies and Mushroom Blocks, the player has to leave a Mushroom Block where an enemy first appears on the screen, and the player has to leave the area without going up a vine or through a door to another area and without attacking the enemy. When the player comes back, the enemy will be trapped in the Mushroom Block. The player must be normal-sized to do this. After Clawgrip is defeated, the player must go on the platform just under the one Clawgrip and his rocks are. That platform can be walked through. Then, the player must run and slide under the rocks and stand up. The player should then be stuck in Clawgrip's rocks. To do this glitch, the player will need to grab a Starman and go in Sub-space and quickly go out while they still have the Starman. If the player did it right, then Super Mario Bros. music will play until the player leaves the area or goes in a door. It is also possible for the player to get that song to play for the remainder of the stage (until dying, going through a door, or a jar), if the player stays in Sub-space until the invincibility wears off. If tried in Super Mario All Stars, the music will only last until the Star's power wears off. The glitch also works in Yume Kōjō: Doki Doki Panic, only it uses different music. In some levels, the character can become trapped with no way to get out or die. One such area is in World 2-2 at the bottom left of the dig-able sand pit. In World 3-2, after defeating Birdo the character can also become trapped if they fall before getting her Crystal Ball. As there is no timer, the only option is usually to reset the game, or use controller two to commit suicide. Super Mario All-Stars has the cheat where the player must pause the game and press the L, R, and SELECT Buttons simultaneously to immediately go to the Character Selection screen and start over where they left off in the level (after choosing a character), but will cost one life if doing so. The player can go into Sub-space and gather coins only twice normally, before the coins turn into small vegetables. However, a visit to Sub-space to collect coins doesn't count against those two times if the player dies before exiting sub-space. To gather a lot of coins in a single level, the player can throw a potion near both a bottomless pit and several patches of grass, gather the grass, and then fall into the pit. The glitch in the SNES remake. This is a relatively major glitch. It requires precise timing: the character must be small, and must go through a jar at exactly the same time he or she is hit by a Phanto. If done correctly, the death fanfare will play as usual. However, the character will still go through the jar. When he or she goes out, the character will have no health sections left in the Health Meter, yet will still be alive. This glitch was not fixed in the All-Stars remake. In any level that has brick walls in them, it is possible for the player to Super Jump into the edge of the walls as Luigi and walk straight up the wall. If the character throws a Magical Potion to a ladder, the door will still appear, but the player won't be able to enter since they will always climb the ladder. ↑ YouTube video of "Drop Mushroom Block in Scenery"
↑ YouTube video of"Enemy in the Ground 1"
↑ YouTube video of "Enemy in the Ground 2"
↑ YouTube video of "Magic Door"
↑ YouTube video of "Super Mario Bros. Music"